Pasta salads are one of my favorite things to eat in the summertime. 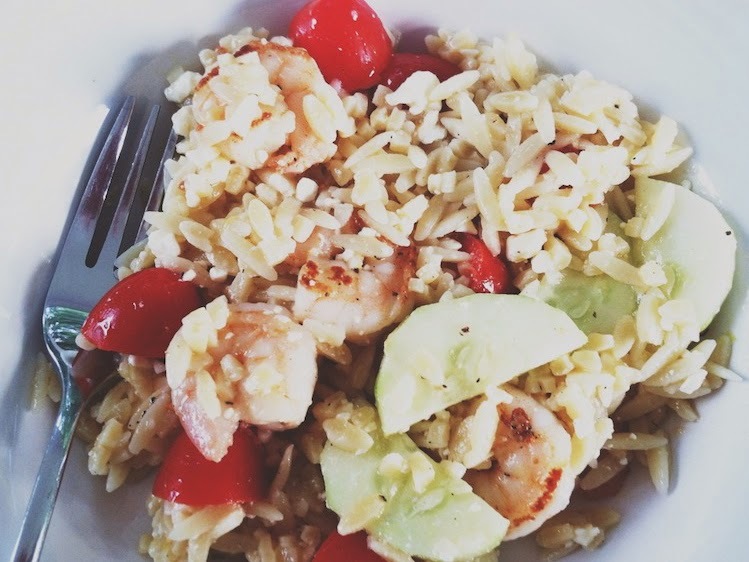 I especially love this Greek orzo salad, so when I found the below recipe for essentially the same salad with shrimp added in, I knew I would love it. It was really easy to throw together and didn't even require turning the oven on--two of my requirements for a perfect summer dinner. Bring a large pot of salted water to a boil. Add the orzo and cook according to the package directions. Drain and let cool. In a large serving bowl, combine the cooled orzo, tomatoes, cucumber, feta, and 1/4 cup of the oil. Grate the lemon zest into the bowl. Squeeze the juice from the lemon and pour it into the bowl. Season to taste with salt and pepper. In a large skillet set over medium-high heat, heat the remaining 1 Tbsp oil. Season the shrimp with salt and pepper. Put the shrimp into the skillet and cook, stirring, until they are jut cooking through and pink, 2-3 minutes. Remove the pan from the heat. Mix the shrimp into the salad and season to taste with salt and pepper once more before serving. Salad will keep in an airtight container in the fridge for up to 2 days. Serves 6.